Lately I've been remixing my haircare routine purely to try out new products and see which one my hair reacts to best. I don't know about you girls (or guys) but I get bored of the same shampoos and conditioners really easily and like to have a look around at what else is out there. However, I prefer perusing the shelves of my local Tesco for affordable products rather than splurging on a shampoo costing £20 or more. I know the quality may be better or atleast different, but I can't justify it. Anyway, I was sent these products a month ago (maybe longer?) and have been using them since so I'd be able to give them a well researched review. "The natural Eucalyptus and essential oils in Root Awakening products actually tingle when used creating an energising, multi-sensorial experience that lets you know the advanced formulas are working from root to tip to promote healthier-looking hair. The gentle yet effective formulas are also safe for colour treated hair, making Root Awakening products a healthy choice for all hair types." The first thing you'll notice when you squirt the shampoo into your hand is the smell. The hint of Eucalyptus isn't strong but it's definitely noticeable but I liked it. If you're washing your hair in the morning then the product will get your senses going and wake you up. I found that using too much product didn't really work in my favour but I'll get on to that later. It lathered up well and the more you work it in to your scalp and hair, the more pungent the scent got. Now, I'm a fan of Eucalyptus, even though it reminds me of Vicks VapoRub and Olbas Oil, but if someone isn't into that kind of thing then this product might not be for them. My mum tried it and said that the scent just got too much for her so she washed it out straight away and didn't even bother continuing with the conditioner. After rinsing out, you'll feel a coolness running through your hair which is where you'll definitely feel awakened, your roots however - probably won't. It doesn't sound as different as that on the shampoo and I guess it's pretty self explanatory, but this is another product that you don't want to use too much of.Although it isn't as strongly scented with Eucalyptus as the shampoo, there is still a definate hint of it in there somewhere. When I first used this product I ended up with too much product in my hair and it felt like it too forever to rinse it out. I never usually have this problem with shampoo or conditioner but there was something about this one that made it stick more, which is one of my problems with it. Another problem that I've had with the conditioner is that it makes my hair virtually unstylable (If that's not a word then it is now!) Although my hair was soft and tangle free, there was no oomph in it whatsoever which got me wondering. 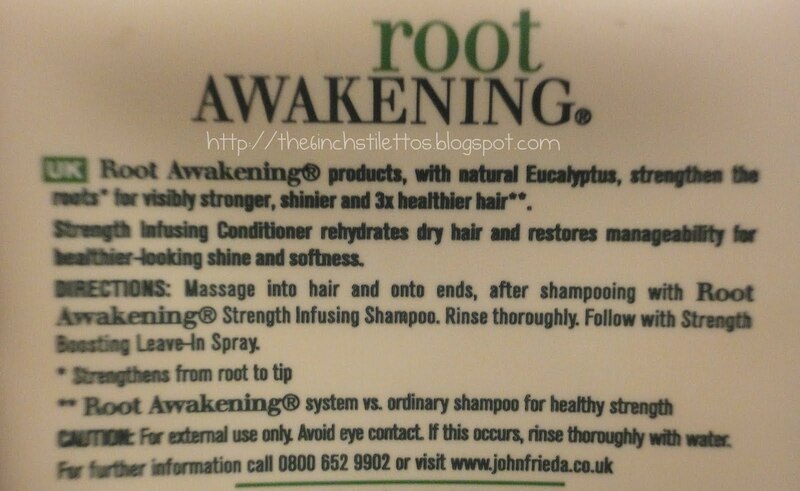 If there products are called "Root Awakening" then surely there should be some kind of volume boosting element to it, right? Having read the press release more carefully the second time around, there was nowhere in it that said it was going to give more volume or oomph to the hair. That was just an assumption I had made from the name of product. Well, what else was I going to think? Root? Awakening? I'm pretty sure I wasn't the only one that thought there would be some hair boosting going on! 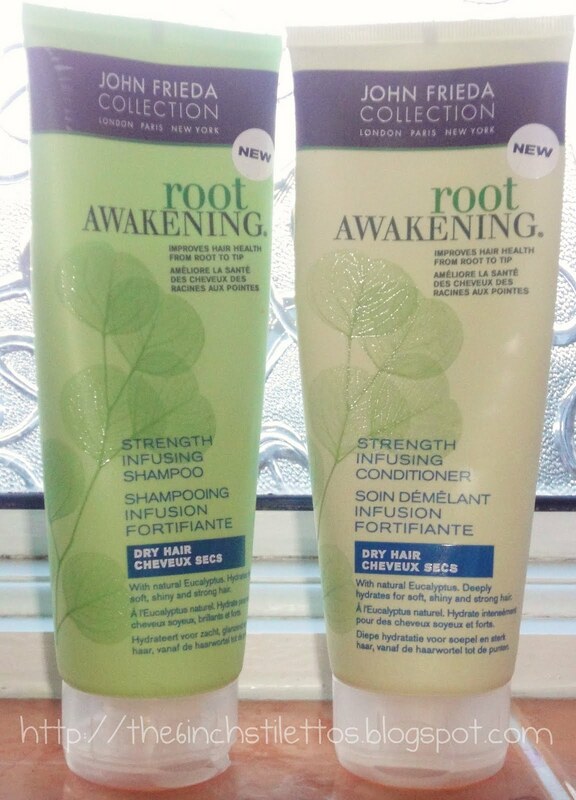 It turns out the "root awakening" element was to promote stronger and healthier hair as opposed to the booting part I was expecting. There was a teeny tiny mention of some bounce but it wasn't a factor that was guaranteed when using the products. So, would I repurchase the products? Probably. I enjoyed using the shampoo and conditioner and loved the tingling feeling on my scalp even more so than the scent itself. Although it left my hair feeling a little flat afterwards, it's nothing that a twist of my Cloud Nine straightners couldn't fix to give a bit of a boost. The products come in really handy squirty tubes so there isn't any fiddling around with taking off lids or sticky pumps but just a quick squirt and you've got enough product to work through your hair, no matter how long or short. 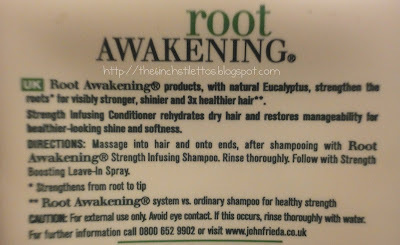 The Root Awakening range by John Frieda also consists of a strength boosting leave-in spray which I'd like to try out in conjunction with these products to see if it makes any difference, so I'll be popping that into my basked next time in Boots. The range is available from all supermarkets, Boots and Superdrug stores nationwide and if you're lucky, might even be on a 3 for 2 deal so you can pick up the whole lot for a reasonable price! I assumed that it would give you some kinda root uplift too, they should really make it clearer! 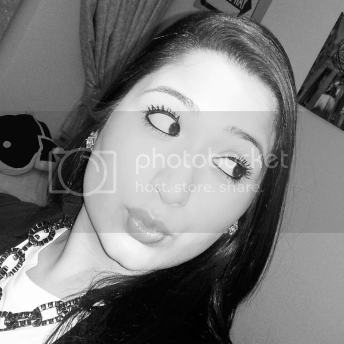 Nice and interesting post. I am impressed. Keep it up.